Janet will be remembered fondly by anyone fortunate enough to collaborate with her. Ever enthusiastic, Janet was a tireless champion for children. 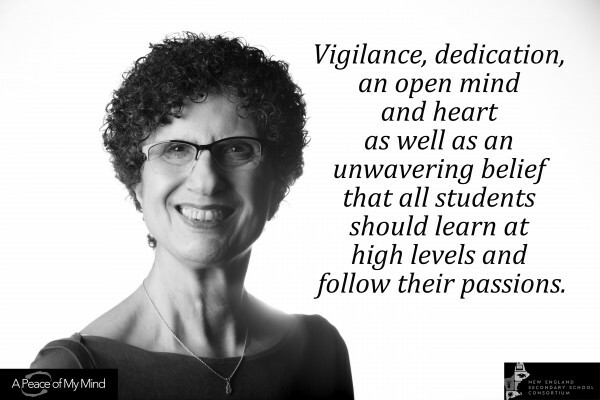 She was a leading voice for promoting personalization and mastery-based learning in Connecticut. She encouraged schools to join the League of Innovative Schools and – in the most supportive way – helped challenge their assumptions and engage in new strategies. She believed deeply in the work of the New England Secondary School Consortium and the capacity of her colleagues in the state and across the region to press forward with difficult changes. Shortly after retiring as a high school principal, Janet joined the Great Schools Partnership family in 2011 and served as the Connecticut state liaison for the New England Secondary School Consortium. We will miss her optimism, her insight, and her friendship. Funeral services will be held at 10:00 AM on Saturday, December 16 2017 at Sacred Heart Church in Groton, CT.
“How do you ensure equity and excellence for all learners?” Photo originally taken for A Peace of My Mind NESSC conference in Hartford, CT.